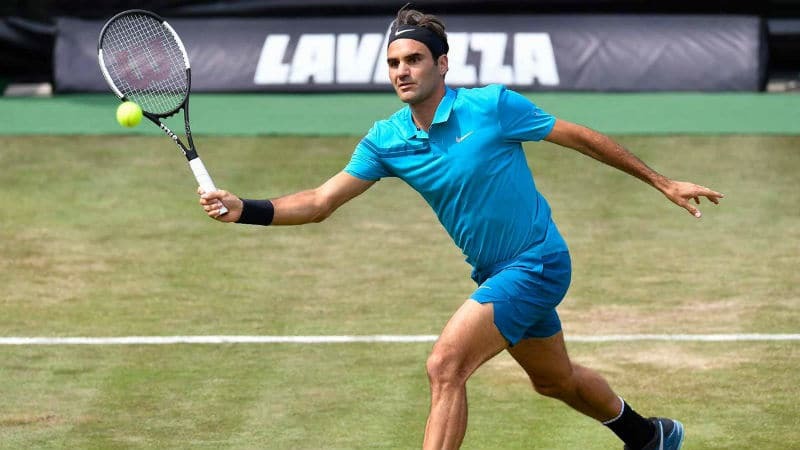 The semi-finals in Stuttgart await as Roger Federer defeated Guido Pella 6-4, 6-4 at the Mercedes Cup to move within just one win of reclaiming the number one spot from Rafael Nadal. The Swiss started his campaign positively against the tricky Mischa Zverev on Wednesday and took things up a notch today, showing off his grass savvy game to cruise through against the Argentine Pella who recorded his first ever wins on the surface this week. Pella won the toss and elected to serve. The Argentine was forced to deuce but held for 1-0. Roger responded with a love hold. Two break points came the way of the Swiss in game five but Pella held on to lead 3-2. Roger was yet to drop a point on serve as he levelled for 3 all and he broke through in game seven, to lead 4-3 before consolidating for 5-3. Pella then held for 4-5 but Roger served it out with ease to take a troublefree set 6-4 with four love games and just one point dropped on serve. Into set two and Pella got off to the worst possible start, dropping serve immediately as Roger produced some slick footwork to thread an inside in forehand up the line for 1-0. The break was consolidated to 15 and from there Federer was in complete control, overcoming 15-30 in game eight and 15-40 in game ten to progress through blemish free into Saturday's semi-final. A super slick performance here from Roger who looks very sharp in only his second match. Pella is obviously a lightweight opponent on grass as he can't really do much damage but Fed played some quality points, moved great and looked very comfortable out there. 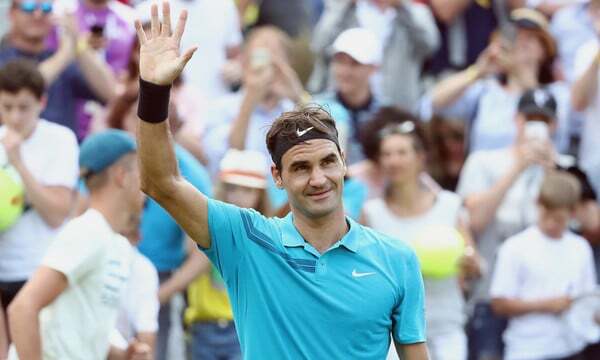 Some of his volleying was top notch and he's just a breath of fresh air to watch with his style, coming forward and stepping into balls that you know 99% of the tour are moving back to play. He's also looking physically in great shape too, strong in the legs and the footwork has been precise, shuffling quickly into position to turn some backhands into forehands today with the one on break point being especially easy on the eye. Next up is the mercurial Nick Kyrgios who saw off Lopez in three sets. Kyrgios is on the comeback trail after an elbow problem and from the stats looks to be serving well. He's beaten Roger before and aside from being schooled by Murray multiple times, whenever he plays the top guys he at the very least runs them close, last years match in Miami vs. Fed springs to mind that went to the wire. With that in mind, I expect a close one here that probably boils down to who can just find the right shot at the right time; a passing shot here or a pickup volley there can make all the difference. I expect Fed to be the more disciplined of the two and that should be enough to see him through but if Kyrgios has a good serving day and doesn't start trying to get too cute with tweeners and whatnot then it could be a third set tie-break job. But it's Fed in 2 for me. What did you guys think of today's match? Predictions vs Kyrgios? Let me know in the comments. Classic grass court tennis from the Fedmeister General who came through untroubled hitting some classy volleys and playing a flawless opening set. Nick lives for big matches already casually praised Roger’s goatness so should be a fun match. Yeah he seems to get up for them, crowdpleaser like Monfils but a bit more balanced, just. Great stuff, and thanks for the writeup Jon. Delighted he’s playing Kygrios, I love their matchup and I really feel like it could have been a great Head 2 Head series if they were closer in age. Hoping Fed takes it but really I just want a good match above all. Number 1 aside Fed has done what he needed to do here to get himself ready for a good grass swing so I’m happy regardless from here on out. Ye it’s produced some good matches, we need a clown for this circus, Laver Cup, Miami, all good stuff. Darn. I’d hoped Lopez would win. I like watching him play on grass. Oh well. Gosh for a 2nd match after 80 days off from the tour that was very sharp. Agree with Jonathan, Rog looks totally relaxed and fresh here. I like that fact that he mentioned that for him the important thing is to not overplay and be as fresh as possible, given his adaptability on grass is supreme. Dont wanna get ahead of myself, but I have to say that I am getting good vibes. Ye skipping clay was always the right move. I saw the match as I was on a day off… My first one on Tennis TV (good for my English language too and with no ads … A pleasure). Just before, I had re-watched on the same Tennis TV last year’s Halle final against A. Zverev. What wonders me is that even if Roger is one year older he still is in great shape. Wonderful footwork, varying his strokes, aggressive and playing forward… all that with a top concentration. Sure Pella wasn’t a tough challenger but it was ideal for Fed today. I did not see the Kyrgios-Lopez match but I feel that the Fedmeister general (!) will be highly motivated to reach the finals and recover his throne. Fed did not hit lots of aces today (just four). It could help if he won more of them on Saturday if he can, maybe. “Allez les Bleus” and Chum Jetze the Swiss Artist (in blue, as well) ! 2-1 France, good prediction. I had that on my Super6 too, Allez! Have a question for everyone, which team do you support for this World Cup? England but after they are gone probably Spain or Uruguay. Brazil. Always been a Selecao fan, right from the Zico-Socrates years. If Brazil’s not there then…Argentina (only and only because of Messi). Never liked Maradona’s dissembling. A distant third favourite is Germany. Come to think of it, the free-flowing football of vintage Brazilian teams (not so much their current team, though) which is known as ‘jogo bonito’ (the beautiful game) is somewhat similar to the smooth, buttery tennis of Federer! Nobody! Just enjoying the games. Spain Portugal was decent. Yeah, like Jonathan I will also enjoy all the matches as well. No more stats for winners and errors? Boo to the stats ppl. Good sharp match. I was courtside again and the ball was flying, very lively. Predicted to be warm tomorrow as well which helps Fed on the ground but Nick on serve! Pella is fast and steady but no weapons and little grass acumen. Rog saw a lot of balls. Going to be a step up tomorrow and I’d like the ace/unreturnable serve stat to go up. Rog came forward a lot today with a lot of energy and I see the same tomorrow. I predict Rog in 2 as well. Nick has played a lot of tennis this week, singles and dubs, dropping sets here and there. Has to be a bit weary. Plus this is their 1st mtg on grass. Advantage Fed? Going to be a very different match to today,but I still think Rog will hv the upper hand. Good to see Nick back tho. I see Raonic making the final. He has been huge on serve and looks pretty fit again………. Allez Rog, take them down.. Thanks for the on-site particulars Susie! I’ve also noticed lower ace count, and is it me or he’s serving more out-wide and less to the T than usual? Yeah the tournament isn’t showing them on the winner / ue stats on screen. Nobody else records them that I can find? Tournament sounds good, looks a good court to watch as fairly up close with the temp seating. What are the facilities like? I see your alliterative “P”s there, Jonathan! I love it when his footwork is working. Agree that I’d like to see an improved 1st serve %, particularly against Kyrgios who can take advantage if he sees a lot of 2nd serves. I have to think Kyrgios is more susceptible to weariness after the injury time off, but he’s younger too & that may offset it – particularly if the elbow is really at 100%. Hope Roger is still rounding into finest form & hasn’t peaked too soon; guess we’ll see tomorrow! 2 sets seems maybe optimistic to me but I do give Roger the edge. Ye Kyrgios seems injured all the time, Susie said he was flexing his hip too in previous post. Who knows what he will produce though. Now refreshing to see him play in style, as Jonathan points out, after a long clay season where everyone just plays at the back and bashes the ball. Oh boy I might just become a double fan after the GOAT retires as there’s nothing to watch in the singles. Awesome play by Roger and great movement out there as you mentioned. I see him raising his level on serves and winning in 2 tight sets and getting back to #1. So glad to see him back playing like only he can. Love watching his tennis. Luck dog Susie….are you staying for the whole tournament? Thanks, Jonathan. Hope he’s on song tomorrow! On not quite a JesusFed day, yet one of the commies said yesterday “Is he even human?” People say his game is real tennis. Are you sure? So enchanting, so different from the rest, sometimes I wonder if he’s playing a different sport. Fedennis? I can’t watch/chat live today 🙁 Over to you guys! Sue, Dippy etc., cheerleaders! and irritable at Stuttgart,did you notice that?